Former President Olusegun Obasanjo has lamented over the palpable disunity in the country, saying that Nigeria is more divided than it was during the civil. To the former president, it’s dangerous development which should be cautiously reversed. He spoke on Thursday during a one-day 2019 annual retreat/conference organised by the Association of Chief Audit Executives of Banks in Nigeria (ACAEBIN) in Abeokuta, the Ogun State capital. He said, “When we look at this country today, even during the civil war, we were not as divided as we are today. Today, we are in danger if we don't take partnership seriously. 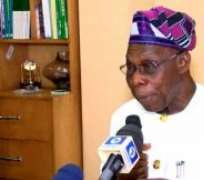 To the members of ACAEBIN, Obasanjo emphasised that the private sector is the life blood of development in every economy. “The next one is prosperity. I am not being bothered about Nigeria's poverty or Africa poverty. We have everything to generate wealth. We have God's given resources under our soil. We also have human resources. If we bring these together, then, we will definitely get prosperity.